The C.A.P.T. building was built with a tax abatement from Celina Aluminum Precision Technology, Inc. It opened in the Spring of 2001. The building consists of a weight room, a training room, one classroom, three locker rooms and a multi-purpose room. The multi-purpose room has four 70 yd. running lanes, two batting cages, and pit areas for pole vault and high jump. Outside access to its restrooms are available to the public. 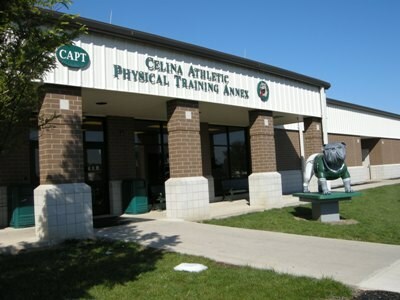 All weight room equipment and multi-purpose room equipment have been funded by the Celina Athletic Booster Club. For students in grades 7-12 and staff use only. Not open to the general public. Hours of operation are dependent on season, team, and student need. (Building is locked during track meets. Outside restrooms on north end open at that time for public use). School Rules apply (smoking, conduct, etc.). No cleats worn in building. Students permitted to use only with a coach present. Seasonal schedule is posted in building. Workout clothes and tennis shoes required to use Weight Room (no rivets, buttons, pins, etc). Hand sanitizer at main door. No gum, food or liquid (except water) permitted. No free weights without a spotter. All weights/belts/bands, etc, to be put away after use. Do not leave machines/bars loaded. Wipe down equipment after use. Disinfectant available at both ends of room.Students permitted to use Weight Room with coach, weight room coordinator or during Open Lift or at scheduled team time. No school = No open lift. 3hr delay = No open lift. Staff may use weight room during open lift or outside of team times. Celina grads may use during Open Lift or outside of team times with a staff member present. Current high school students have priority on equipment. Used for in-school lifting program during the day. For injured players or players under trainer’s care for rehab ONLY. No one permitted in the training room unless school trainer, coach, weight room coordinator or student trainer is present in the room. Applied Physiology classes during the day.